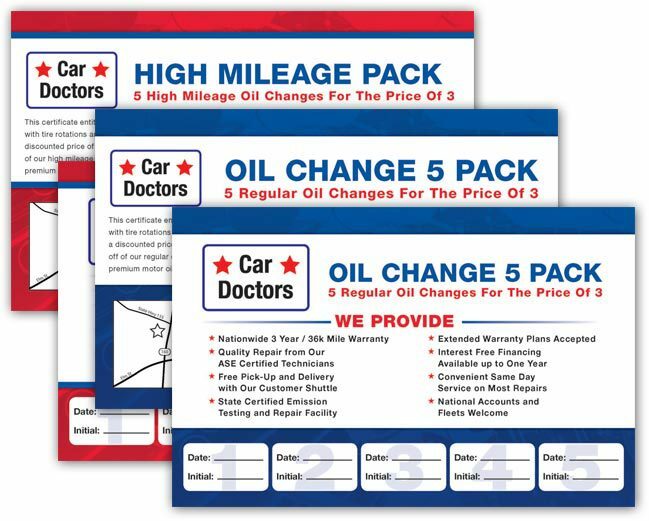 As successful automotive shop owners ourselves, we have found that a great way to make more money is to sell a 5-pack oil change card. This is a successful tactic because if we lock in a customer for 4 to 5 oil changes, then we actually have 4 to 5 chances to provide a Preventative Maintenance Inspection and repair work that is uncovered with that PMI. The 5-pack oil change card provides an extra tool in your tool belt because you get the opportunity to upsell the customer. For example, a customer comes in and just wants an oil change after having declined all PMI work. Customers realize they will always need oil changes, so they can easily see the value in this card and will spend the extra money. Thus, you will be able to take a basic oil change ticket and increase your profit with the higher cost 5-pack ticket. Plus, you know that the customer will be coming back for 4 to 5 oil changes in the next 12-15 months. You can charge whatever rates are normal in your market. It’s just important to make sure that customers see a value in your offer. It tends to work better to offer 5 lower price oil changes than a buy 4 get one free. Normally, the consumer’s perception is the lower price oil change is a better deal than the buy 4 get one free even though it nets out close to the same amount of money. Another way we add value to this card is that we allow anyone in the household/family to use the card. Our logic is that we want them to bring us ALL their cars, not just one of their cars. So, by allowing them to use the same card for all their cars, we can provide PMI’s on more than one car. Evaluating multiple cars increases our odds of locating safety or maintenance items that need to be fixed. In addition, we have the opportunity to develop a relationship with all their family members who drive, which can help us lock in that business forever. By allowing use of any family car, we can expand our referral network, because now the father, mother and possibly a child driver are talking about our company. Since most all shops lose money on oil changes anyway, our focus should be on driving multiple cars in and making money on the PMI work and future repair work. You can make the program work in many ways, but this is how we have been able to maximize our customer base and really lock in long term business.